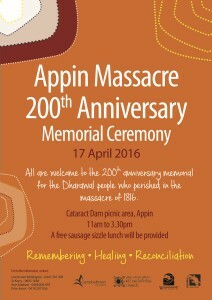 This year’s annual memorial for the 1816 massacre of Dharawal people is the 200th anniversary of this tragic event. The event is starting slightly earlier than usual as it is expected that there will be significantly more people attending. Gather at the Cataract Dam picnic area at 11:00am. The event will go until 3:30pm. A free sausage sizzle will be provided. For further information contact Sister Kerry on 9605 1838 or Peter Jones on 0418 297 056. 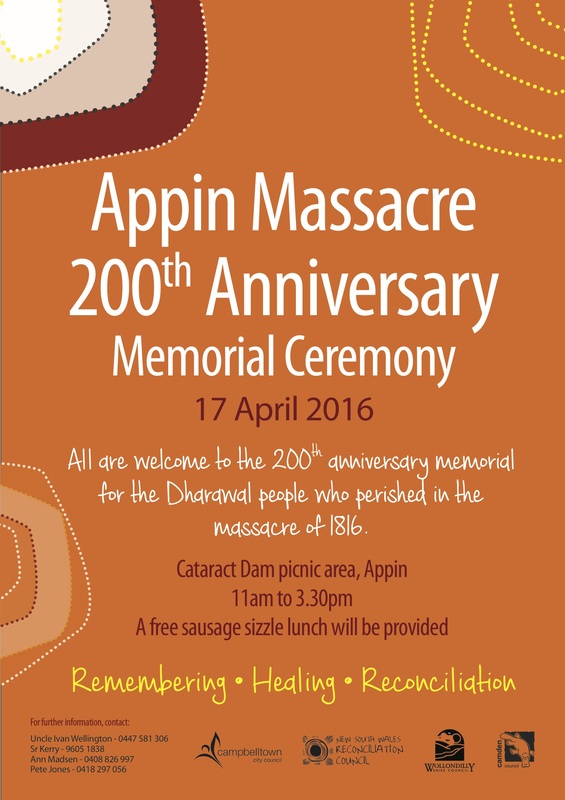 The event is hosted by Winga Myamly Reconciliation Group and supported by: Campbelltown City Council, Wollondilly Shire Council, Camden Council, Sydney Catchment Authority, W.I.L.M.A, the NSW Reconciliation Council and the Aboriginal Communities of the Macarthur Region.